Sound Affects PremierNamm 2019What we are looking forward to at NAMM 2019! Guitarists worldwide are itching to make a new purchase but at the same time holding off to see what new products are going to be announced. In under two weeks the Anaheim Convention Center will open its doors for Namm 2019. For those of you who don’t know, Namm is the worlds largest trade-only event for music products and technology located in Anaheim California. We are pleased to announce that we will be attending Namm for the 2nd year looking for exciting new products and sharing content with you via social media. There is still a lot of mystery surrounding Namm and what products our favourite brands are going to announce. But with that in mind here are the top things we are looking forward to at Namm 2019. Announcements from PRS came in early this year. We have been seeing the first wave of 2019 product plans circling the internet for a few weeks now. If you haven’t stumbled across them yourself here is what we have to look forward to. First up is the McCarty 594 Hollowbody II. As you would expect this combines the popular Hollowbody II and McCarty 594 designs to create a new beast entirely. Featuring a fully hollow build paired with 58/15 LT (low turn) pickups we cannot wait to hear its resonant, warm, woody tone when we visit the PRS stand at Namm. Watch this space for more info on the McCarty 594 Hollowbody II. Next up is the revamped Paul’s Guitar. Since Paul Reed Smith has every option available to him when building a guitar we think it is worthwhile taking note when he updates the Paul’s Guitar. This model is the realisation of Paul Reed Smiths latest vision and is aimed at guitarists who want a versatile guitar that is stage/studio ready. Boasting TCI (tuned capacitance and inductance) treble and bass pickups with two mini-toggle switches that allow players to put either or both pickups in either humbucking or true single coil mode there aren’t many tones this guitar won’t be able to achieve. We’ll be working our way through the pickup configurations when we get our hands on it at Namm. “I don’t just like the newest version of my guitar, I love it. With these new pickups, I can move from a strong bridge pickup to a very clear, “whoopy” neck pickup – you can hear every note – by just setting the mini-toggles and using the 3-way as normal. It’s a highly musical and very usable setup,” said Paul Reed Smith. 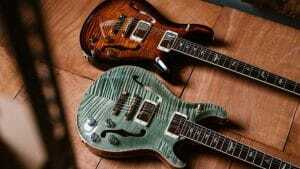 Last year we saw PRS add variety to their popular SE Custom 24 by adding a selection of unique veneers. 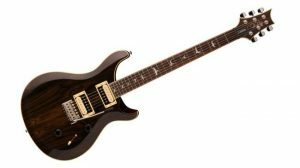 In 2019 we’ll see PRS add both Zebrawood and Ziricote veneers to achieve a Custom 24 with an exotic look. We’ll be sure to get some pictures for you at Namm so you can see the finer details and pick which veneer is best for you. The final announcement from the first wave of products is that PRS are adding to their popular SE Acoustic range. The SE A55E and T55E borrow fromPRS’s Private Stock aesthetic with quilted maple back and sides offered in two colors: classic Black Gold Burst or striking Abaco Green. The SE A60E and T60E also provide assortment with ziricote back and sides, curly maple binding and heel cap, and abalone purfling and rosette details. 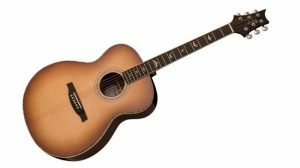 Both the 55 and 60 series acoustics feature solid spruce tops PRS’s hybrid classical/X bracing, bone nuts and saddles, and the Fishman GT-1 pickup system. To summarise there is a lot to be excited about in 2019 thanks to PRS. Seeing these guitars in person will be a highlight of Namm and we can’t wait to show you more. 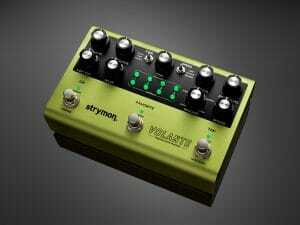 There is always a lot of hype surrounding a new Strymon release. Just last week they hinted at a new product release and message boards came alive with guitarists guessing at what the pedal may be. Well now we know.. Introducing the new Volante Magnetic Echo Machine! This pedal includes Three Magnetic Delay Types, a Spring Reverb, Looper & more. Capable of re-creating vintage delay tones and futuristic soundscapes the Volante will be appearing on shoegaze pedalboards in no time. We can’t wait to get our hands on it and will be sure to share any content here. Imagine a pedal built by an ex-military explosives expert turned pedal builder and a legendary pedal designer. Well, Adrian Thorpe has joined forces with Dan Coggins (former Lovetone pedal designer) to bring us the ‘Deep Oggin Chorus/Vibrato.’ This fully analogue pedal promises 3 dimensional sounds with enough versatility to suit the needs of any guitarist. Featuring controls for Depth, Rate, Blend, Volume and Treble this pedal keeps it simple but is packed with a variety of sounds. 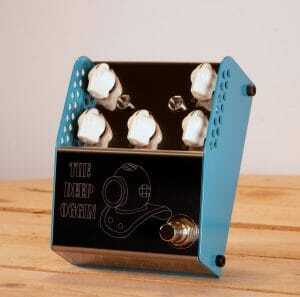 For stereo pedal enthusiasts, they will be pleased to know that the DEEP OGGIN has both dry and wet outputs. Premium components enhance the premium sound and the pedal aesthetically looks amazing. We can’t wait to hear this pedal in action and will be visiting our good friend Adrian Thorpe at Namm to get some content. We also plan to get Andy Hiller to demo the pedal when we get our hands on the first prototypes over on our YouTube channel. We love a good mystery and often find ourselves refreshing manufacturers websites to see if there has been an update. JHS pedals seem to be keeping quiet this year but the fact that they are attending Namm is enough for us to be intrigued. We’ll definitely be visiting their stand to see if anything new is coming in 2019 (fingers crossed). Now this is how you announce a product. Taylor have uploaded a mysterious video with nothing but a date as its title and promises to mix things up. Watch the video yourself and see if you can decode what is going to be announced. Be sure to to take a look at the videos comments as the guessing game doesn’t appear to be slowing down. Watch this space as we’ll be there on the 23rd getting first look at whatever it may! EQD have quickly become one of the most exciting boutique pedal designers around and we always look forward to getting our hands on their new pedals to see what crazy exciting sounds we can create. 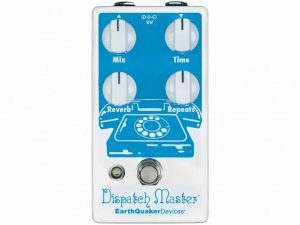 The first announcement from EQD is an update to their popular Dispatch Master pedal. V3 boasts EQD’s Flexi-Switch, which gives you two footswitching modes: latching and momentary-style. With the former, the effect is engaged/disengaged by tapping on the footswitch – like a regular pedal. And with the latter, the effect stays engaged as long as the footswitch is held down. Other than that the pedal is the same as V2 and produces some of the best reverbs we have heard. Whether you want to hear your guitar in a small room or in a cave the Dispatch Master is capable of 1.5 seconds of delay time. Perfect for dreamy shoegaze soundscapes. The 2nd announcement from EQD may appear to be less exciting than the first but if your pedalboard requires a switching system that does not affect your tone then this could be your next purchase. The Swiss Things pedalboard reconciler may appear to be a complex piece of gear but once you see it in action it all becomes clear. Still not clear? Check out this video to see it in action. 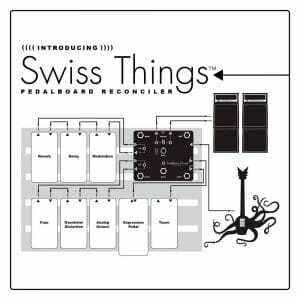 We cannot wait to see the pedalboards EQD have built to show off the Swiss Things at Namm. I’m sure we will be able to hear the unique sounds before we see the stand. Watch this space! If you’ve dreamed of an all analog pedal packed with features in the vein of EHX’s Canyon or TC’s Flashback, this pedal is for you. 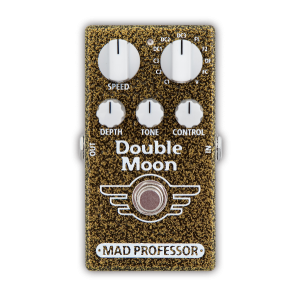 The Double Moon from Mad Professor has 11 carefully crafted sounds that can be easily dialled in and modified via a simple rotary knob. From slapback to shoegaze the Double Moon is one of the most versatile bucket brigade true analog delay pedals we have seen. Sounds include 3 chorus effects, 3 dual chorus effects, 3 flanger effects, flanger+chorus and a vibrato. There are a few videos circling YouTube of the product in action but we can’t wait to get our hands on it to see what the pedal is capable of. Watch this space for more content. The ‘Studio 10’ amplifiers from Blackstar have been gaining some attention over the past few weeks and we look forward to trying each of them at Namm to see how they perform. Influenced by history’s most iconic amplifiers, three new 10W single-ended valve amplifiers have been developed each with a different power valve: KT88, EL34, or 6L6. Studio 10 EL34 – The elegant Studio 10 EL34 is a low gain, classic British crunch amp with an EL34 in the power amplifier and an ECC83 in the preamp stage, resulting in a flawlessly boutique, sultry crunch. This model includes a footswitchable pre-amp Boost for an authentic classic rock and indie rhythm tone and articulately powerful blues leads. Studio 10 6L6 – Studio 10 6L6 deploys a 6L6 output valve and an ECC83 in the preamp stage to give this amp a distinctively American bright clean sound and searing lead tone. The built-in overdrive circuit – inspired by our renowned HT-Drive pedal – takes the lead tone from dynamic crunch to a singing, smooth legato and remains composed and graceful. Studio 10 KT88 – Studio 10 KT-88 is driven by the monumental KT-88 power amp valve and an ECC83 in the preamp stage. Benefitting from the extra headroom of the KT-88, the Studio 10 KT-88 is the pinnacle of dynamic modern cleans and tight high-gain overdrives. In addition, the patented ISF control gives unparrelled access to more distortion flexibility than any other single-ended valve amplifier on the market. Watch this space for more content on Blackstar! There is so much being released at Namm that it would be impossible for us to fit it all on this blog. So here are a few items we will also be looking forward to seeing in action. 2 products announced (so far). The Six B.O.D. claims to combine sounds from three iconic boutique overdrives – the Timmy, Bluesbreaker and KOT – within a single enclosure. If the Greek pedal company can pull this off we could be looking at one of 2019s highlights. We’ll be in line waiting to hear it in action.